"SheSpeaks Back-to-School Member Review Giveaway"
Back-to-School is here and we're sure you are trying out some great new products! 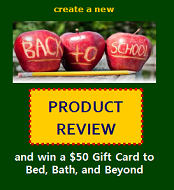 We'd love to hear what you think of the latest and greatest Back-to-School products. Create a new Member Review, by August 19 and you will be entered into a drawing to win a $50 Gift Card to Bed, Bath & Beyond. It will ask you "What would you like to review?" Type the name of the product on the box. If the product is NOT on our database, it will prompt you to "Add a New Product." If the product has an existing review click on "Review Now" to add your thoughts. Create as many product reviews as you want, to share with the community! Oh, don't forget to tell your friends to check out your review on SheSpeaks.